At Cooper Street. There's an awful lot going on here at the corner of Bank and Cooper, which recently spawned rainbow flags. At this building alone, there are five stores each on each floor. Behind the building on Cooper is the infamous Turning Point record shop. This building also used to housed Exile Infoshop, an alternative bookstore and community space, and So Go Chinese restaurant. At the far right in the background, you can see the relatively recent Mondrian condo building. We rely on Canada Post trucks to deliver our mail, so who delivers the Canada Post trucks? Gloucester Towing, evidently. At the corner of Cambridge and Arlington. The result was a puddle on the sidewalk, which didn't make for good walking conditions, now or when it freezes into solid ice. When the water doesn't drain, it can freeze into ice when the mercury drops. This is a hazard for pedestrians and vehicles, but it also seeps into the pavement and expands, creating potholes. That's why it's best to clear the snow and slush away from the drain when it's warm. 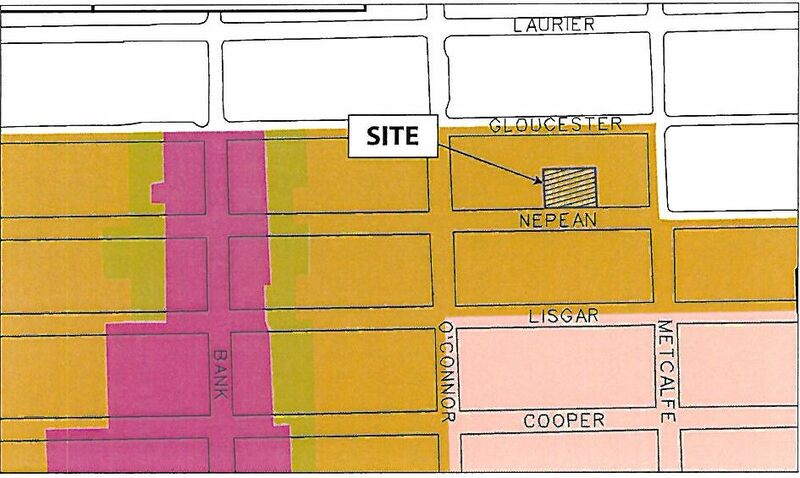 That map is based on the map (PDF) in the Centretown Secondary Plan. The white area at the top is the Central Business District, outside Centretown. 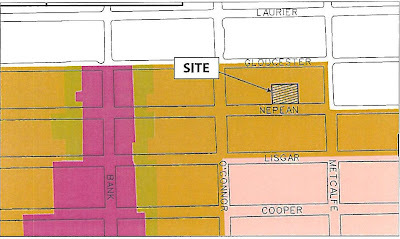 The pink area is the "mid-rise" zone, which was envisioned to max out at about 9 storeys. The brown area where this site sits is supposed to be a "transition zone" between the central area (which generally has tall buildings), and the mid-rise area to the south. Of course, the biggest Winterlude attraction is the 7.8-kilometre long Rideau Canal Skateway, the world's largest skating rink. Unfortunately, both the canal and this sculpture have suffered from this week's midwinter thaw. In their stead, why not check out my many previously-posted photos of the canal, under the label "Canal". The Elphin is an apartment building at the south-west corner of Gladstone and Metcalfe. The front entrance is currently being renovated, and the exterior lobby doors have been removed. Perhaps they're being permanently removed to leave the buzzer outside, as is the trend for new developments. For reference, Google Street View shows the previous entrance, without the "no dogs" signs. A bus without ads is a rare sight. I stared at this #14 on Gladstone at Bronson for a few seconds before noticing the gas station sign in the background. I liked how this juxtaposed two different transportation options, so I quickly pulled out my camera before the light changed. As I took the photo a pedestrian serendipitously walked into the frame, adding a third mode to the picture. The fourth mode is the bicycle, as in the one I was on when I took the photo! At Somerset and Percy Wednesday night, flames engulfed the attention of Umi Café customers, who spontaneously watched, YouTubed, and beat-boxed as this young lady danced with fire outside the alternative coffeeshop. It was cold out that night, so I didn't stop long on my way home. I wonder if the flames kept her warm! This is C.C.B. Electric Works, at 564 Gladstone Avenue. As the sign says, it's been serving Centretown with electric motors and parts since 1907. The owners proudly display antique equipment in the middle section of their storefront, which used to be Nicastro's. C.C.B. stands for Crowe, Costello and Black, and was previously at 378 Bank Street, across from Lewis Street. Here's a shot from 1979 supplied by Midcentury Modernist. Spacing Ottawa announced last week that aerial photographer Alex MacLean will be presenting at Ottawa's Urban Forum on Wednesday, February 16, 2011 at 7pm in the Champlain room at City Hall. "Alex S. MacLean, international award-winning photographer, author, and pilot, will provide a one-of-a-kind vantage point in the search for successful urbanism through his stunning photography." Coincidentally, I took some aerial photos last Monday on my trip to Toronto, where urban planner George Dark gave a tour to Councillor Holmes, her assistant Robert, City planner Melanie Knight and me, focusing on Section 37 projects. Here's a shot of the Rideau River where Roger Stevens Drive crosses it, just south of Manotick. The penninsula contains the Carleton Golf & Yacht Club on Marina Drive. It's interesting timing that MacLean uses aerial views to search for good urban planning, because the NCC has just posted a video of Jan Gehl's October 2010 talk, "Cities for People", in which he argues that urban planning and architecture focuses far too much on the "airplane" and "helicopter" views, and not nearly enough on the 5km/h pedestrian scale. It's a long talk, but he covers a heckuva lot of ground and it's all interesting. No, not another lament for the loss of Centretown's heritage. Much lighter fare in this post. I stayed with a friend on New Year's Eve, and woke up to the thick fog that blanketed town that day. Here is the view of the downtown skyline from their top-storey balony. Can you recognize the location? Many familiar buildings are in the skyline, which grows from the Library & Archives Canada building at the far left, up to the Juliana Apartments, the Gardens condos, to Place de Ville Phase III--the tallest building in Ottawa. The tall building at the right is 570 Laurier, which was built with only one or two visitor parking spaces, to the chagrin of current residents. In front of it is the Stonecliffe apartment building.